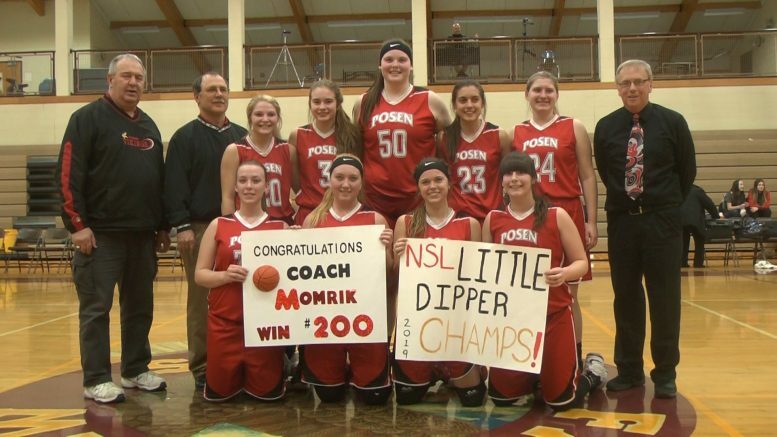 The Vikings claim the Little Dipper title the same night that coach Karl Momrik earns his 200th win with the Vikings. Fairview, Mich — For the second time in less than a week, the Posen girls basketball team had a chance to claim the North Star League’s Little Dipper title. The Vikings lost with about twenty seconds to go in their last conference game versus Hillman on February 14th, but looked to rebound against Fairview Tuesday night. A slow first quarter had Posen on top 11-4. Jaedyn Winton scored all four points for the Eagles, while Brooke Ciarkowski scored five for the Vikings. Both sides came alive in the second, but Posen still led 25-17 at halftime. A seventeen point third helped to secure the win for the Vikings as they won the game 52-30. Posen claimed the Little Dipper title as a result of the win. This was also Posen head coach Karl Momrik’s 200th career win with the Vikings. He’s been coaching at Posen for twelve years and also has eight conference titles on his resume. Posen has one more game against Rogers City before districts begin in Wolverine. The Vikings will face Hillman in the first round on March 4th.